Larry Garner is perhaps the most talented blues songwriter alive today, one of the top five bluesmen on the planet. Garner's mellifluous lead guitar chops are akin to B.B. King's and are relatively free from rock influences, playing extremely listenable blues. He churns out clever, challenging, uncompromising, contemporary songs. Larry has a devoted following throughout the United States and across the Atlantic Ocean. He is on tour all the time playing gigs and Festivals in Europe and England. The English fans have really taken Larry to their hearts and are the most appreciative of audiences. He is also on the road continuously in the US where he is in great demand. 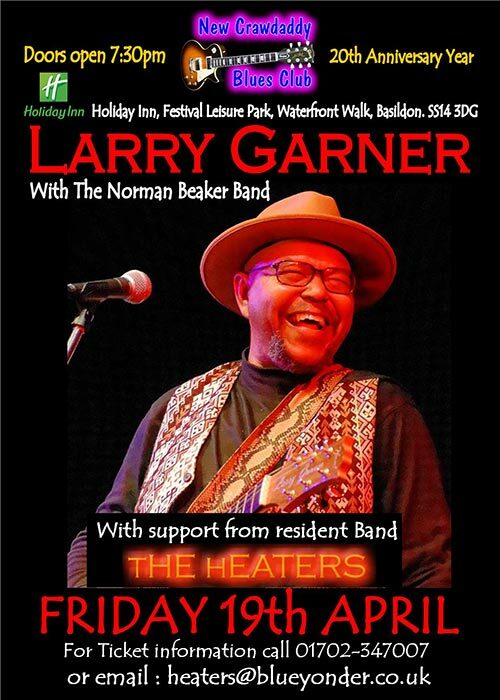 Larry Garner and The Boogaloo Blues Band won the 5th Annual International Blues Challenge back in 1988, and has toured extensively since. Larry is a five-time Blues Music Award nominee, once for Most Promising Artist, and four times for Contemporary Male Blues Artist. He was inducted into the Louisiana Blues Hall of Fame in 2002 and the BBC honoured him as its Bluesman of the Year, as well as being honoured as Blues Songwriter of the Year three times. Larry was twice awarded the Bluesman of the Year Award by Real Blues Magazine. With backing from The Norman Beaker Band, this is going to be a great night.